Buying a home is an important and exciting event. For first-time homebuyers and experienced buyers alike, the prospect of purchasing a new home can seem overwhelming and exhausting at first, but it doesn’t have to be. Team Aro has helped thousands of people buy and sell their properties in Gig Harbor and the surrounding areas, and we can help you alleviate the stress of buying a new property. In today’s post, we’ll walk you through the first two steps you should expect when you’re buying a home. Whether you’re a current Gig Harbor resident or you’re looking to move here from out of town, Team Aro is here to help you through every step of the home buying process. Contact our team of Realtors® today to find the property of your dreams! If you’re beginning to think about buying a home in Gig Harbor, it’s never too early to think about where you’d like to live. Would you like to live close to the Gig Harbor Golf Club, or would you like to live a bit further out of town, perhaps near Kopachuck State Park? Gig Harbor is a fairly small area, but it has a variety of locations that are ideal for different lifestyles. Young singles and couples are attracted to the downtown area for the dining and variety of nightlife activities, while older couples tend to enjoy living further away from the hustle and bustle of the city. If you have friends and relatives that will be visiting you, you may want to find a location that’s close to the Tacoma Narrows Airport. If you have children, consider the schools in Gig Harbor and which one you would like them to attend. Make a list of everything you do in your daily life, and try to find an area that closely fits your current and future needs. Whether you’re a first-time homebuyer or a seasoned veteran, the most important consideration you’ll make during the buying process is your budget. Your credit is important during this stage of the buying process, and you’ll generally be approved for better loans if you have good credit. If you’re not sure about your credit score, you can always speak to a lender to find out and discuss your options. Consider the down payment you can afford to make, and if you currently own a home, you’ll need to figure out if you’re going to sell it before you buy another home. Remember that mortgages and lenders have become more flexible, and it’s highly likely that you can find a payment schedule that fits your budget. 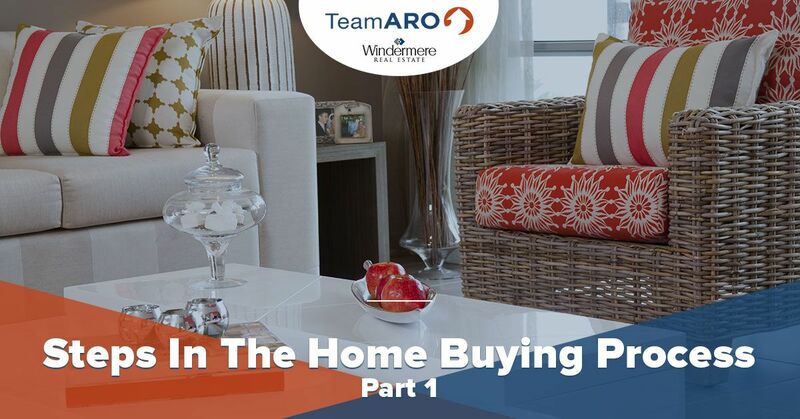 Stay tuned for our next and final post in this two-part series, in which we will continue walking you through the steps of the home buying process! Whether you’re looking for your first home or you’re an experienced home buyer, our experienced real estate agents can help you navigate your way through the large number of real estate listings in Gig Harbor. Contact Team Aro today for a consultation!